These personalized bracelets are designed specifically for men with larger and heavier proportions and a bold elegance. The look is classic, yet completely contemporary. 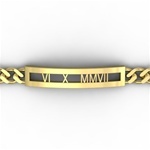 Personalize them with your special date in Roman numerals, a name, words, or Chinese symbols. Available in your choice fo 14k gold and sterling silver. A wonderful gift for yourself or the special man in your life.